Saint Martin (known in French as Saint-Martin, in Dutch as Sint Maarten, and SXM if we’re talking in airport codes) is an island in the northeast Caribbean. The division between French and Dutch dates to 1648, with approximately half of the population on either side. 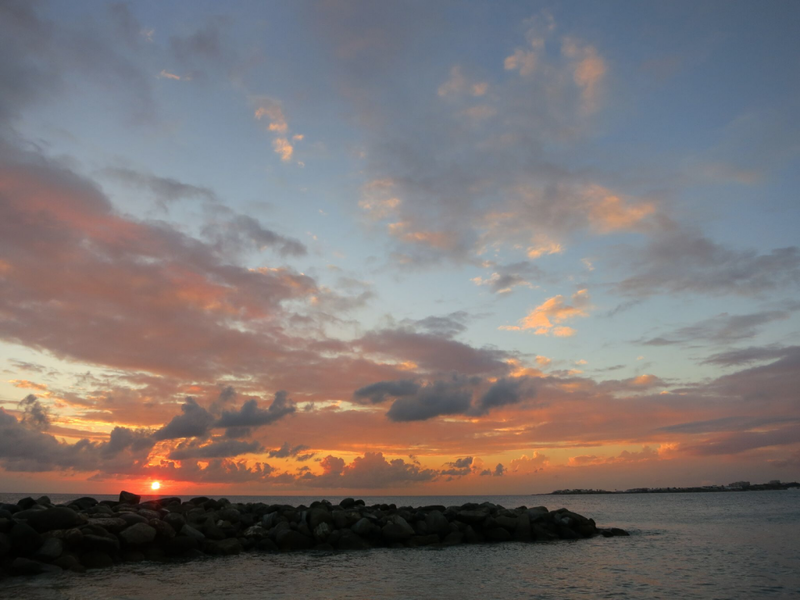 Not as well-known a vacation destination as some other Caribbean spots, Saint Martin has glowing sunsets, white sand beaches, beautiful tropical diving, and a relaxing, low-key atmosphere. At least, it did, until last week, when it was slammed by Hurricane Irma. This week, as this sweet island paradise was battered by the Category 5 storm, I looked back over my travels and recalled my time on that island with special fondness. Saint Martin will always have a spot in my heart as my first Caribbean island vacation and the place where I learned to scuba dive. On either side of the airport on Maho Beach, there is a famous bar. When I first arrived in town, I was greeted by my friends and this was our immediate destination. The Sunset Bar is so close to the airport runway that you can see the planes fly right up above you. Locals and tourists gather on the beach and press their bodies against the chain link fence to get the closest possible look at the planes on the other side. They cheer, laugh and take photos as the planes zoom in, creating a wall of wind and noise. 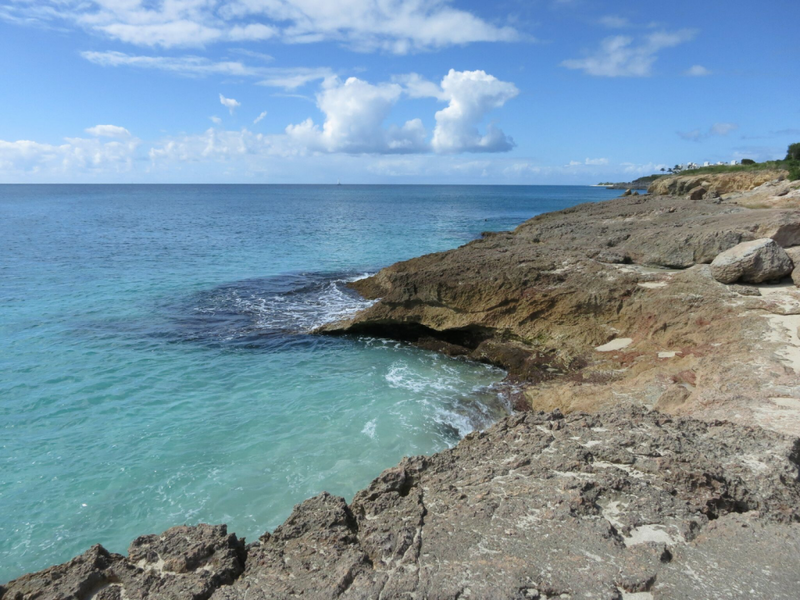 One of our main reasons for visiting Saint Martin was the phenomenal scuba diving. 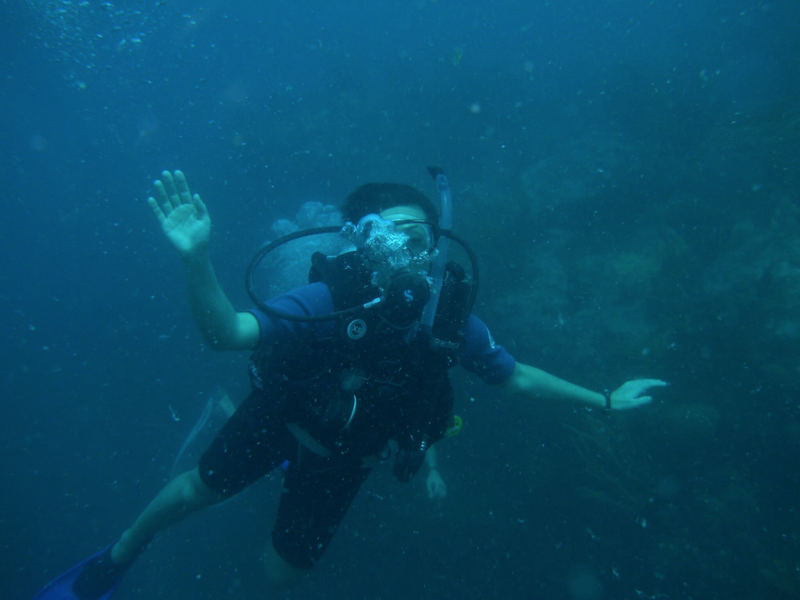 It was my first scuba trip, and I was nervous, but my fears were all handled when I saw that I was in great hands with Aqua Mania Adventures in Simpson Bay. This local diving and tourist business has comfortable boats, high-quality diving gear and all the items you need to rent in order to have a great time diving. As a brand new diver, I completed my initial diving education ahead of time, then finished with a classroom session and a training session in a resort pool. The instructors worked with us to make sure we were comfortable in the water, understood how to assemble and check our gear, and could perform all the tasks needed to be safe. My instructor, Sandra, was witty, friendly, and instilled confidence in me immediately. We really enjoyed diving with her and the Aqua Mania team. This is an important thing to consider when diving because you’ll be spending a fair amount of time with your diving guides, and if you’re new, having a good rapport with them will go a long way toward making your trip comfortable and enjoyable! Diving can be scary, but the experience is definitely worth facing your fears. The philosophy of this dive crew seemed to be: go over the basics, make sure everyone is safe, then just throw you in! We covered more technical details in the pool the second day, but our first dive was quick and exciting. Visibility wasn’t very high, but I had little to compare it to, and I was immediately enthralled with the act of diving. We may not have seen many rare or unusual creatures, but having never strapped on a scuba mask before this trip, I was in love with every common parrotfish, coral, and anemone. The strangest and most difficult part of the dive, for me, was the first descent. We giant-stepped off the back of the boat and descended very slowly, just a few feet at a time, using a rope line to measure our way down and pausing to equalize the pressure in our ears every few seconds. In my diving daydreams, I had imagined this going much faster and worried that I was taking too long. I kept thinking of stories I’d heard of friends blowing their eardrums while diving, and I wasn’t taking any chances. All of a sudden, there I was, holding the end of the line, my fingers bumping against the solid metal weight! I was surprised when it came into view — I thought I had much further to go! Already, time and space were starting to dissolve as I focused on only what was right in front of me in the water. Distances are strange down there, color and light are muted and distorted. Things look closer than they are, everything is bluer, and I was struck by the persistent sensation of flying through outer space. For most of this first experience, I was just thrilled to be underwater, breathing successfully, controlling my buoyancy, not panicking, and properly equalized. I hadn’t realized how much fear I’d brought to this experience until that fear started to disappear, to be replaced by a sense of capability. That first giant step into the water with all my heavy gear on was vaguely like the first time I jumped from a trapeze tower in a circus class: a possibly deadly step into the unknown. The dark water was less frightening for me than the open air and trapeze heights, though, and as soon as I took that step off the boat, things felt completely natural. The fear was simply gone. I was horrified to learn that Hurricane Irma has destroyed 75% of the homes in St. Martin. Reflecting on my adventures in St. Martin usually lifts my spirits; today it reminds me of everything beautiful about the Caribbean and everything worth protecting and rebuilding. I hope I can give something small back to the place that helped me discover some new and wonderful things, as well as conquer some of my biggest fears. The Center for International Disaster Information, a part of the United States Agency for International Development, offers useful tips on how to help after a natural disaster. Sending money is always helpful and welcome! The NY Times published, “How to Help Hurricane Irma Victims (and How to Avoid Scams)”. This article is a great starting point for learning about the organizations doing the most to help rebuild. With this and any large disaster, it pays to do a little bit of homework before deciding where you will donate. Charity Navigator is my go-to for evaluating which charities to support. Here’s their guide to giving after Hurricane Irma. Enjoy this post? Pin it for later! Irene Malatesta is a marketing strategist, writer, designer and avid traveler. Her goal? To build authentic connections through shared creativity and storytelling. You can find her on Twitter and Instagram @irenekaoru.